It’s no secret that I think bacon must be the food of the Gods. I’m firmly convinced that bacon is what they greet you with when you get to heaven. It’s also no secret that I hate cooking bacon on the stovetop. The grease gets everywhere and pops all over the cook. So, I was very happy to learn sometime in the past the way that bacon is prepared in restaurants is by baking. In the oven. No popping and no grease to clean up from the stovetop afterwards. I can’t express how happy I am to know this secret. So, I’m passing it on to anyone else who needs to know. First, heat the oven to 400. 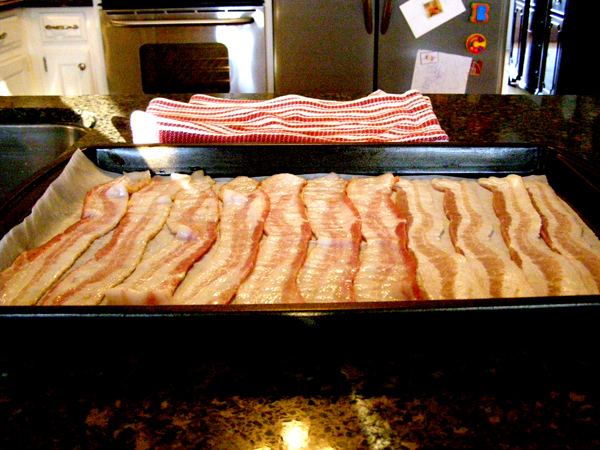 Then all you do is get a baking pan, line it with parchment (that’s just for me – it makes cleaning the pan easier) and lay out your bacon. 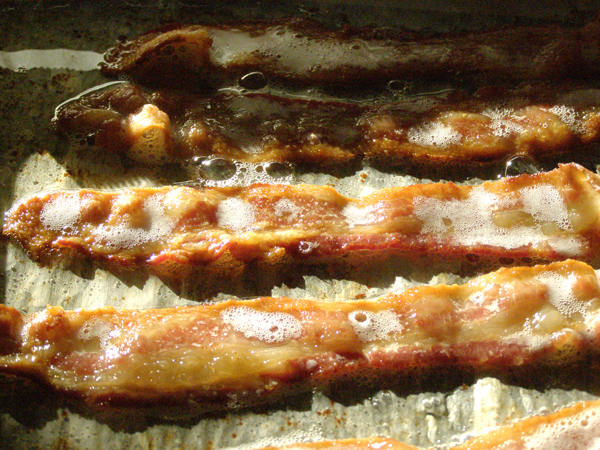 Pop the bacon in the oven for about 6 minutes and then turn it once. Put it back in for about 6 more minutes or until it is as crispy as you like. Remove it to paper towels to drain. That’s it. You won’t believe how much easier this is than cooking in a skillet on top of the stove and you can’t tell any difference in the taste or texture of the cooked bacon. I do a whole pound or two pounds at once. After baking and draining on a paper towel, I put it in a plastic bag and freeze it. I take out as many strips as I need and put it on a paper towel in the microwave (with a paper towel on top to catch splatters)…About 1 minute in the microwave and it is like it is fresh cooked. If it is getting too brown in the microwave, cut down on cooking time or undercook it a little when you bake it. Great idea! Thanks for stopping by the blog. This is the best way to make bacon. You will never cook it on the stove top again !!! You’re so right! The easiest way that I know of and no mess. I still cook my bacon this way. I love the no clean up aspect of the whole thing! Really, the parchment paper will just slip off into the trash, and presto!! Clean….. Ahhh.